Looking for an appropriate birthday gift or something exclusive to send on New Year Eve? Do not look beyond our Cake with Roses Hamper. The Cake with Roses Hamper has 15 multicolored roses bunch and a 1 kg Black Forest Cake. 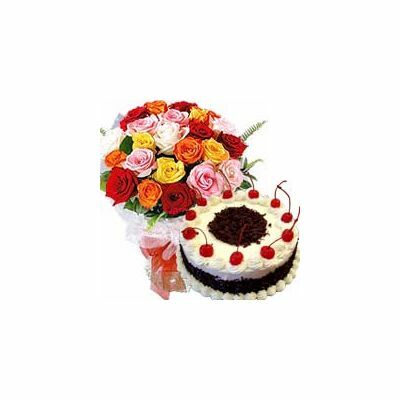 Our creative florist has arranged the fresh and colorful fantastic roses beautifully in a bouquet; send roses bouquet online along with the cake to sweeten up someone’s day. The Cake with Roses is an ideal gift for anniversaries, birthdays, weddings and other special occasions. 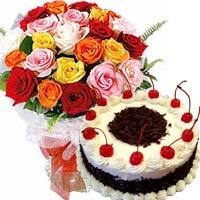 Send flowers and cake to show your love and good wishes.We offer home delivery and same day delivery facility.